Yesterday we started using the analogy of an old card game Top Trumps. Home.co.uk set a blistering pace but can new boy Zoopla trump the other 4 property portals? Founded: The newest site reviewed and yet one of the smartest and most usable. Founded in 2008 Zoopla is very new. Rightmove, FindAProperty, Home and PrimeLocation trump it in age alone, but Zoopla is far to established to worry about that. Properties selling: With Zoopla now has 345,714 properties for sale. It is just shy of the others : Zoopla, Rightmove, FindAProperty and PrimeLocation, but Zoopla is relentless to make it to the top and its caught the pack at an amazing speed. Properties renting: Proportionally similar to its selling number. Zoopla has 131,348 on it’s books. Rightmove, FindAProperty, Home and PrimeLocation all have a few more properties to rent. Number of Estate Agents: With 9,268 Estate agents, Zoopla has commanded a lead over FindAProperty and PrimeLocation. It still has a long way to catch Home and Rightmove. 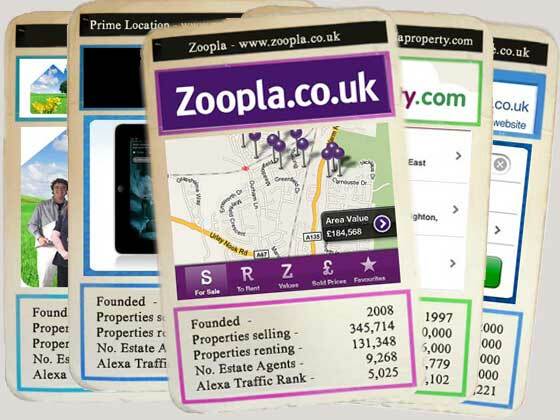 Alexa Traffic Rank: Search engines love Zoopla, as do buyers and Sellers. Zoopla recently overtook Findaproperty in it’s Alexa Ranking and now has it’s eye on catching Rightmove. Its leaving Home and PrimeLocation in the dust. Does Zoopla look ready to topple the mighty Rightmove? What are your thoughts? Zoopla has less properties than Rightmove, FindaProperty, Primelocation, etc. If analysed via a professional webstats package you would see that Zoopla gets fewer users than Rightmove, FindaProperty and Primelocation.